Our commitment to the community extends far beyond providing healthcare services. Alivio leads and is regularly involved with numerous community outreach programs. We engage with our patients and their families to educate them about their long-term health, the Affordable Care Act (Obamacare) and health plan enrollment and eligibility. 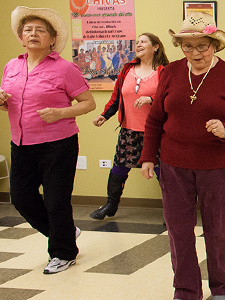 Our senior programs are open to all, and we are dedicated to the health and well-being of women, infants and children. Casa Maravilla is a senior housing building in Chicago’s Pilsen neighborhood. Our family case management program educates and counsels our community on everything from finding schools with GED programs and assisting with immigration issues to offering healthy cooking demonstrations and breastfeeding classes. Our Compañeros en Salud (Companions in health) serve as true partners in health to our patients living with diabetes. You can read more about our peer support program here.